Darien on the isthmus of Panama was the former first colonial base for Spanish Panama. On 3 November 1698 it became the location for the ill-fated 'Darien Venture' Scottish colony. 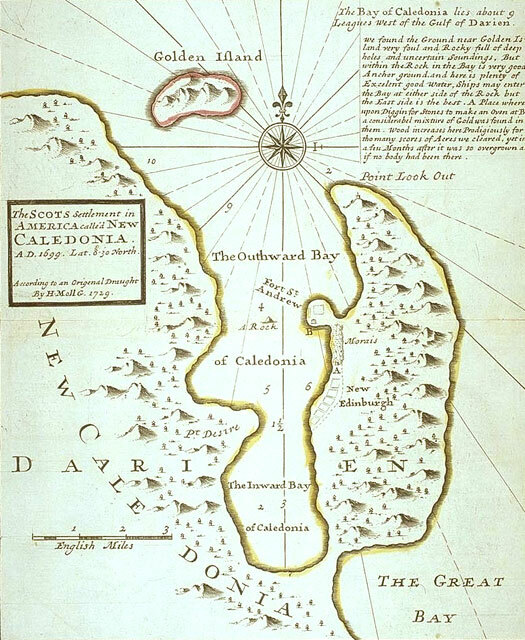 Named New Caledonia, the 'capital' of New Edinburgh was part of an ambitious scheme to start a new life outside the British Isles which ended in loss of life and financial ruin. Scotland at the end of the seventeenth century was in a state of crisis. Decades of warfare, seven years of famine, and the nation's trade apparently crippled by England's continual wars against Continental Europe all combined to choke home-grown industry. Financial adventurer William Paterson came up with the answer: turn Scotland into the major broker of trade across the Pacific Ocean. This would start with the settling of a wonderful paradise on the Isthmus of Panama, with a sheltered bay, friendly natives, and rich, fertile land. A fleet of five ships sails from Leith Docks near Edinburgh in Scotland, carrying 1,200 settlers to found a colony in Panama. The Scots find a large, sheltered harbour with a supply of fresh water. They go ashore and build an entrenched fort that they name Fort St Andrew. First governor of New Caledonia. The settlers find that their land in Panama is unsuited to agriculture. Torrential rain and disease kill more than two hundred colonists by March 1699, with a death rate now standing at over ten a day. The ships sent out to trade for supplies return with news that all English ships and colonies are forbidden to trade with the Scots by order of the king. The colony is abandoned on 20 June and only reoccupied on 30 November by the second expedition, which knows nothing of the fate of the first. A leader of the second expedition. Rampant disease again kills many of the colonists, most of whom are entirely unprepared for the harshness of the territory they are occupying. The Spanish are massing to attack from the Panamanian mainland but a Scottish pre-emptive attack routs them. Further Spanish forces arrive and besiege Fort St Andrew, which surrenders in March 1700. The colonists agree to leave on 11 April, but only a handful ever make it back to Scotland. Today the site of New Caledonia is largely overgrown jungle, although the fort's trench can still be made out. Somewhere beneath the tangle of undergrowth in the area is the Scottish cemetery in which hundreds of the dead had been buried. It has yet to be rediscovered. The area is still known as Caledonia.